Mark Wilson/Getty ImagesPresident Donald Trump is facing mounting pressure to react more forcefully to the disappearance of Saudi journalist Jamal Khashoggi. Foreign-policy experts say the disappearance of Saudi journalist Jamal Khashoggi is “embarrassing” and a “crisis” for President Donald Trump. Experts seem to disagree, however, on how big of a challenge this poses to Trump’s overall agenda. They say the situation creates tension between Trump and the GOP foreign-policy establishment in Congress. Experts believe Trump won’t do much about Khashoggi, and will let Congress take the lead. Khashoggi went missing after entering the Saudi consulate in Istanbul earlier this month, and is feared dead. The disappearance of Saudi Arabian journalist Jamal Khashoggi has placed President Donald Trump in a precarious and “embarrassing” position, and it will complicate his agenda in Congress, foreign-policy experts say. There is a great deal of concern over the message Trump is sending about America’s commitment to human rights via his response to the situation, but experts disagree over how this will impact the US-Saudi relationship and Trump’s foreign agenda in the long run. There is consensus among experts, however, that this situation is creating tensions between Trump and key Senate Republicans on foreign affairs and he’ll likelydefer=”defer”to them in terms of an overall response to Khashoggi’s disappearance. Khashoggi, a US resident who wrote for The Washington Post, went missing earlier this month after entering the Saudi Consulate in Istanbul and is feared dead. Turkish officials have accused the Saudis of sending in a 15-man team to torture, kill, and dismember Khashoggi’s body before flying it back to Saudi Arabia. The Saudi journalist, who was often critical of Saudi Arabia in his reporting, went into the consulate on October 2 to obtain documents to marry his Turkish fiancée,Hatice Cengiz. Cengiz said she waited for roughly 11 hours outside of the consulate but Khashoggi never came out. The Saudis have vehemently denied detaining or harming Khashoggi, and claimed he left the consulate. But they have provided no evidence to back up this assertion. Meanwhile, the US intelligence community reportedly intercepted Saudis discussing a plan to capture Khashoggi prior to his disappearance under the direct orders of Crown Prince Mohammed bin Salman. The Trump administration has denied it knew of such a plan. Trump has expressed concern over the Khashoggi case, but he’s under increasing pressure to address the situation more forcefully. A bipartisan group of senators led by Senate Foreign Relations Committee Chairman Sen. Bob Corker recently invoked the Magnitsky Act, a law requiring the president to investigate the incident and report back to the committee within 120 days on what is discovered and what he plans to do. But Trump seems reluctant to punish the Saudis, whom the US has long had close economic and military ties with, and sees as a buffer against Iran in the Middle East. This week, for example, Trump said it would be a “tough pill to swallow” to stop billions of dollars worth of arms sales to the Saudis. But senators in both parties are pushing hard for the sales to cease in the wake of Khashoggi’s disappearance. In short, Trump is between a rock and a hard place over this disturbing situation. He feels the way Trump has handled the situation thus far has been “absolutely dreadful and insensitive.” Rothkopf said Trump has “minimized” and been “slow to respond” to the case, setting a troubling precedent regarding the US government’s position on human rights. Trump this week downplayed Khashoggi’s disappearance by noting he went missing in Turkey and was not a US citizen. Rothkopf said a “strong American president” calls out allies, but Trump has failed in this regard. “There are very real questions about whether Trump’s disinterest in human rights and his repeated attacks on the press may actually have contributed to this case,” Rothkopf added. This could lead arms sales to be completely cut off and sanctions to be imposed via the Magnitsky Act, he said. It would also put pressure on Crown Prince Mohammed bin Salman “from within the kingdom where he has many rivals” and elsewhere in the region, Rothkopf added. Ian Bremmer, the president and founder of Eurasia Group, said Trump faces much bigger foreign-policy challenges than Khashoggi’s disappearance and doesn’t think it will have a “broader” impact on the president or America’s agenda abroad. Bremmer told Business Insider the current tensions between the US and China, dealing with Russian election interference and cyberattacks, and the Iran nuke deal withdrawal are all “much more challenging” for Trump. The Khashoggi disappearance “is embarrassing to Trump and is causing a rift between the president and the foreign-policy establishment in the GOP,” Bremmer said. But he added that the situation is “much more important to the media (and understandably so)” than to Trump’s overall foreign-policy agenda. In terms of Trump’s response to the situation thus far, Bremmer said the president is in a good position to support any Senate-backed economic repercussions against Saudi Arabia moving forward. 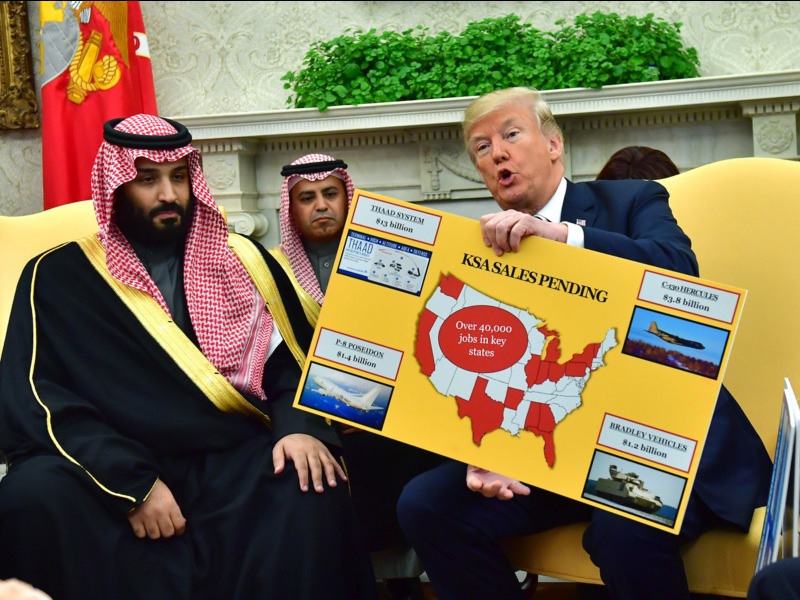 Kevin Dietsch-Pool/Getty ImagesPresident Donald Trump does not want to reduce arms sales to Saudi Arabia as a response to Jamal Khashoggi’s disappearance. Under Trump, Bremmer said the US-Saudi relationship is “better than they have been in a while.” This is linked to the royal welcome Trump received in Saudi Arabia, the first foreign country he visited as president, and the fact the Saudis are spending a lot on US exports. Randa Slim, director of conflict resolution at the Middle East Institute, also does not see Khashoggi’s disappearance as a major foreign-policy challenge for Trump and sees it as more of a roadblock in terms of his relationship with Congress. Slim said Trump’s vocal opposition to reducing arms sales to Saudi Arabia shows he’s not planning on addressing the situation in a significant way. “Look at how he is dealing with Russia and Putin as the roadmap for how he will deal with Saudi Arabia and the Crown Prince going forward,” Slim said. From a rhetorical standpoint, critics feel Trump has been troublingly soft on Russia and too deferential in terms of reacting to its interference in the 2016 presidential election. The Trump administration has imposed significant economic sanctions on Russia, among other diplomatic repercussions, but the president has at times exhibited a reluctance to do so.